Toolboxes for trucks at Cap Connection are guaranteed to last you years as you work on your professional jobs and DIY projects. Throw your hammers, screwdrivers, wrenches and levels in one of our UWS, DeeZee, Undercover Swing Case, Geneva or Better Built truck tool boxes. 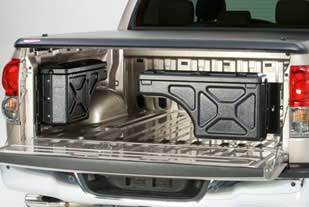 These truck accessories are constructed from the most durable materials – order yours today! The name says it all: Better Built tool boxes for trucks are manufactured to give you longer life and better durability through the elements. Products from Better Built are constructed from high strength aluminum. Contact the truck experts to inquire about toolboxes for sale at Cap Connection today!